Ben Knowlton is the director of sales at Metropolitan Shuttle, a leading nation-wide event transportation company. Ben and his team work with both corporate and private clients to provide a wide range of event transportation solutions dealing employee shuttles, evacuation services, group outings and even mobile billboard services are all in a day’s work for Ben and his team. Prior to Metropolitan Shuttle, Ben was one of the top relocation consultants with Olympia Moving and Storage. He provided a concierge relocation service to some of the most discriminating clients in the mid-Atlantic region. Ben Knowlton: Metropolitan Shuttle provides event transportation solutions nationwide and in Canada, and what excites me about that is we’ve been able to leverage technology and the expertise that we have on our team to really create a meaningful competitive advantage within our industry. 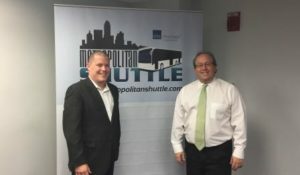 Metropolitan Shuttle is positioned for rapid growth in 2018. Fred Diamond: Tell us some of the things that you do. We mentioned a little bit in the introduction, but why would someone hire your company to provide a service? Ben Knowlton: The bus industry is extremely fragmented so if you want to work in New York, that’s fine, you can call up a New York bus company. But maybe you’re a large company and you want to work in DC, in Miami, in LA, in Phoenix. You’d have to manage 20 separate relationships or more to make that happen so for large clients we make it really easy to work with us across the country. For smaller clients we just are very easily found. We’ll talk about this maybe a little bit later but when you open up your phone and you punch in Charter Bus El Paso, we come up in the top results and that’s the same across every major metropolitan area in the US, so we’re easy to be found. Fred Diamond: Who are some of the companies or people at the companies that you are selling to? Ben Knowlton: A lot of HR professionals trying to plan corporate outings, meeting planners, people who are trying to put together major conferences, sales trainers are a great people, they bring in hundreds if not thousands of people for sales training. Anybody who’s organizing an event with hundreds if not thousands of people are a great point to contact for us. Fred Diamond: Very good. Tell us about the beginning of your career. How did you first get into sales as a career? Ben Knowlton: I fell into my career in sales. I initially wanted to get into an operations position and they gave me the interview and they said, “You know, we hired somebody else but we think you’d be great at sales.” And I was really interested in the company, wanted to get on the ground floor so I signed on to Greenlight Biofuels and that was my first sales job. Fred Diamond: Where were you? Is this after college, did you actually do other jobs before you moved into sales? Ben Knowlton: Yes, my first passion was international development and renewable energy so I had just come back from doing a six month stint in Kenya doing solar power refrigeration and trying to save the world is great but not extremely lucrative so I came back and wanted to still do the renewable energy thing, but try to make more money for myself. And so that was the biodiesel company that I started with, that was Greenlight Biofuels at Beltsville, Maryland. Fred Diamond: What were some of the lessons you learned from that first job in sales? And after my first year, I’d been in over 3 thousand restaurants or been with 3 thousand clients, that’s everything within a 50 mile drive Downtown DC. The first one is you’ve got to put in the work, I’ve met really talented people that haven’t put themselves in front of enough opportunities to be successful so work ethic has got to be #1. Number 2 is continuous improvement, you’ve always got to be sort of tuning up what you do. I’ve been up against competitors that have had contracts for 20 years and they just assume because they had it for the past 20 years that they were going to get it for the 21st year, and then all of the sudden some young guy comes in with a bunch of good questions and walks out with their contract. You’ve got to keep sharpening your skills, you’ve got to keep re-evaluating what you’re doing because if you get complacent somebody who’s smarter or hungrier that you is going to come and eat your lunch. Number 3, it’s all about value, it’s all about relationships, it’s not all about price. Too often I find sales people are complaining that they can’t sell their product or their service because of their price point and what they don’t realize is that they’re focused on the wrong differentiator. At Olympia I purposely created the highest dollar relocation service available. I would walk in the door of my clients and state that I would be the highest dollar quote that they’d receive today, and I’d be happy to explain why that was the case. In more instances than I can count I’ve had these clients handing over their Amex and just saying, “Ben, I want you to take care of this for me, just don’t show me the bill.” So it’s not about the dollars, I think you’ll find that expertise and trust will trump dollars almost every time. Fred Diamond: Today you’re selling charter bus services, tell us a little bit about the value that you can provide someone that another charter bus company won’t be able to provide. Fred Diamond: That’s an interesting point you just made, low bar to set. A lot of companies, you’re right, they just mail it in. They don’t take it to the next level and even a little bit extra could make that huge amount of difference. Ben Knowlton: Yeah, we’re really focused on that. We try to approach this as a consultative sale, we’re not just taking estimates and sending orders. We want to sit down with our clients and really figure out what their needs are, leverage the expertise that we’ve got on the team to provide them the best solution so they don’t have to get to their destination to realize they’ve got the wrong bus size, they’re not going to have the best experience doing this tour on a 60 foot vehicle that needs 5 parking spaces to park on the side of the road. It’s been really good for us. Fred Diamond: What are you an expert in? Tell us a little more about your specific area of brilliance. Ben Knowlton: Well, I don’t know about brilliance but I like being creative, I like coming up with out of the box solutions. For example, I was having a lot of trouble in my first job at Greenlight with specifically Asian style restaurants, they were very difficult accounts to get into, one because the language barrier or that they could always say the owner wasn’t there. And I remember specifically being in the Strip Mall and I was watching this health inspector go in the back door of all these restaurants and it never occurred to me to go in the back door, and so that was sort of a moment for me, I went home, I got into a suit, put all my contracts on a clipboard and I went into my Asian restaurant clients that had been putting me off for months, and I essentially kicked in the backdoor of these places and there would be these line cooks just staring at me blankly and I’d say, “Hey, I need to talk with the owner” and more times than I can count the owner would come out shuffling very politely and have a perfect conversation with me in English, and we’d discuss the poor service that they’d be getting and how at a minimal cost they could improve the service that they were receiving. After that I never looked back, it was a game changer for me. Fred Diamond: One thing that we’ve noticed with the game changers that we’re interviewing as part of the Sales Game Changers podcast is that they’ve gotten great mentorship over the years. There have been people that they would recognize for helping them understand things. Who was an impactful sales career mentor in your career and Ben Knowlton, how did they impact your career? I’m also going to throw in Pete Goshat at Olympia Moving, he really sort of reinforced to me that you could be a hands off, laid back sales manager and still demand high performance from a sales team. Fred Diamond: You manage a lot of people who are new to sales. Do they look towards you as a mentor as well, you think? Ben Knowlton: Absolutely, you’ve got to lead from the front, I’m a firm believer in that. I’ve had bad bosses, I’ve had good bosses but the ones I’ve always respected were the ones who were willing to get down in the trenches, go in the sales calls and help you close deals. Fred Diamond: How do you do that? How do you act as a mentor for some people who are new to selling charter bus services? Ben Knowlton: It starts with the training, we all do at least three or four days training before we get on the phones here. Again, it’s heavy in role play, we make all of our mistakes in the training room so that they feel confident going into their first sales calls. Those first three weeks are critical for us because if they’ve got the confidence to close deals, they’ll continue. It takes a real special individual to fall down a hundred times and wipe themselves off and start all over again, and so I help them by giving them the tools that they need to close deals. Fred Diamond: You’re the first person that we’ve interviewed on the Sales Game Changers podcast that sold this particular type of service. Tell us how likely is someone brand new off the street to be successful. Is it a heavy churn type of an industry or is it something where the right people just kick in and gravitate and next thing they know they’re just killing it two years later? Ben Knowlton: I would say that it is a fairly high churn rate but I don’t think that that’s a direct result of the skills that they bring to the table or the opportunity that’s presented to them, it gets back to work ethic. Unfortunately, I find a lot of people think that they can come in and have an easy sales job. They come in, they hear that it’s all in bound leads, they don’t have to go knocking door to door, they think they’ve got a plush position but I don’t care what you’re selling, it’s a hard job, you’ve got to put in the work and so it’s work ethic that really tends to separate the wheat from the chaff. Fred Diamond: What are the two biggest challenges that you face today as a sales leader? Ben Knowlton: It’s a great follow on question for this. When it comes to performance, most teams have a top 20%, a middle 60% and like a bottom 20%. The trick is how do you move that middle 60% to be more like the top 20%. As a sales manager, getting people to actively change their behavior, it’s a big challenge. Fred Diamond: OK. How successful are you, what are some of the things that you try to do? Ben Knowlton: Well, I came into Metropolitan Shuttle about a year and a half ago and we’ve had a real revolution in integrating this sort of consultative sales approach. Before, it was much about speed, how fast can you get back, but I wanted to have our clients have a memorable experience on the phone with our sales reps and that also differentiated us in the industry. So that, for people who’ve been doing it one way 6, 7, 8 years was really difficult but the results are making them look at it a little differently. Fred Diamond: I’m just curious, I know you’ve had a bunch of highly successful sales professionals. Tell us just generically about your top two sales professionals. Tell us what they look like, their experience, I’m just curious. Ben Knowlton: They come from all sorts of backgrounds. My top two sales professionals are actually first generation immigrants, one is from Russia, one is from Korea. They’ve been doing this job 6 and 8 years respectively and so with that sort of tenure in this industry they’re making very good money and they’re able to essentially work 9 to 5, get home, put the kids to bed and sort of leave work at work. As opposed to somebody who’s in their first year who probably needs to be putting in 10, 11 hours a day just to learn the industry, build the relationships and get comfortable talking about value on the phone. Inside sales is a little bit different where you can’t pick up on all of the body language that you can and face to face, belly to belly interactions and so you’ve got to really learn how to listen deeply. That can be a trick for some people. Fred Diamond: What is the #1 specific sale success or win from your career that you’re most proud of? Take us back to that moment. Ben Knowlton: I like all of them, they’re all good. But if I had to pick one, it would be probably winning Marriott for Greenlight Biofuels. We were growing fast at this point and I think we went from something like 5 employees to over 100 in four and a half years. We were now a regional player and I wanted Marriott’s hotels from Baltimore to Atlanta. 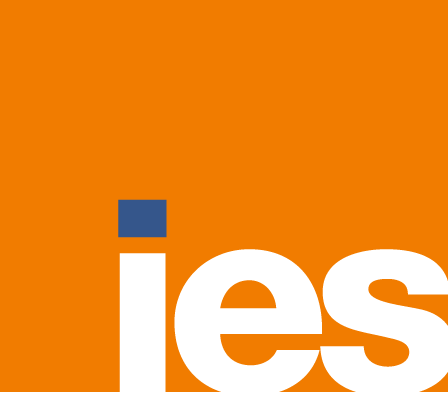 I did my homework, I knew what their new initiatives were and I knew that we were a perfect fit so after a lot of LinkedIn sleuthing I picked out a few key executives to focus on and those executives eventually got me to Brad Nelson who is their global corporate chef. He was an extremely busy individual but with some persistence I got myself a meeting at headquarters here in Bethesda. Sitting across from him one on one I pitched him on how I thought we could help him in his new initiatives and he genuinely liked it and I was sort of really amped up that we were going to go ahead and do a deal. But on my next presentation to a Marriott I brought out that letter and it was to some kitchen manager and he just lit up. He’s like, “Hey, let me call the hotel manager.” And he got on the phone, he’s like, “Hey, this guy’s from corporate, they want us to do this new program and we just got to make this happen.” And so that happened into every Marriott that I walked into. That little letter was gold, and it was clear to me that Brad was not only a great leader but everybody knew him and everybody liked him. And so we landed over 800 hotels with that one letter. Ben Knowlton: I came prepared, I knew exactly what his new initiatives were, I knew the corporate culture and the policies that he wanted to enact and I knew that we were something new in our industry, that we were offering that sort of tack on it where my competition wasn’t even thinking about these things. They were just sort of operating the background, we’ve had this stuff forever and so I think he just said, “You know, this is really just waste cooking oil out on the back loading dock, not too much can go wrong.” So he only had a lot to gain from it. Fred Diamond: By doing some research, you said you scoured LinkedIn – LinkedIn is obviously the best sales tool in the history of mankind in my belief – so you went through, you figured out what the connections were, you understood what the challenges were, you read articles, you went to the meeting prepared, you didn’t get what you thought you were going to get but it wound up being something probably even ten times better. Ben Knowlton: Yeah, because we didn’t have to go through all the loop holes, the legal system, the contracts having to perform maybe in areas that we were weak, we could really just go and pluck out what we wanted. Fred Diamond: Curiously, do you still keep in touch with him? Ben Knowlton: He’s been promoted since I’ve last talked to him. He’s now heading up their operations and so I haven’t been in touch unfortunately but I’d love to take him out to lunch and thank him. 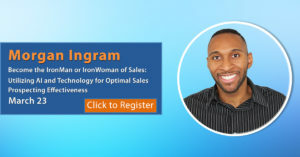 Fred Diamond: Do you ever question being in sales? Was there ever a moment where you thought to yourself, “It’s too hard, it’s just not for me.”? Ben Knowlton: After Greenlight, I had a number of great opportunities presented to me and they were both national account rep sales positions at large fortune 500 companies and living in hotels and living out of airports was just not going to work for me. I was starting a family and so I was talking to a local business owner at a moving company and he was going to give me a lot of latitude for what I wanted to do so that’s the position I picked up. But after working there for 2 years I quickly realized that I was fighting for budget cautious clients and I wasn’t getting the traction that I really wanted. What I wanted to do is not fight for the budget client but I wanted to go the completely opposite direction. I went really high end, and I mean really high end, but I also knew the operations team supporting my sales wasn’t able to produce that. So I did my research and I found Olympia Moving and Storage and I called them up and I said, “Here’s what I want to do, I want to create a relocation concierge for high end clients, I’ll move my book of business over to you but I need your operations team to support me with the best possible service, no questions asked.” And that’s what we did. After tapping into the right referral networks here in DC, I was in the finest estates and homes here in the mid-Atlantic area. We were moving million dollar art collections, wine cellars, gym equipment, some of the hardest stuff to do, and we were doing it with some of the most discriminating personalities you could possibly imagine. So when you’re moving grand pianos over marble floors, when you’re moving really high end items you’ve got to know what you’re doing. At the end of the day that’s what I wanted to do because I could talk about that value. At the end of the day it wasn’t whether this was going to cost you $100K or $110K, it’s who do you trust to do the job right. Fred Diamond: Ben, what is the most important thing you want to get across to junior selling professionals to help them improve their career? Ben Knowlton: This is going to sound extremely simple, but it’s very empowering once you embrace it. You are responsible for all the problems in your life. It’s very easy to find fault outside ourselves and for the situations we find ourselves in but here’s a clue: It’s not your parents, it’s not your significant other, it’s not your boss, the product or service you sell, it’s you. And once you realize this you can start planning and plotting how to change those things. Fred Diamond: That is true, accountability. What are some of the things that you do specifically to sharpen your saw and stay fresh? Ben Knowlton: 7 years ago I joined Network Bethesda, it’s a group of local business owners. We get together for breakfast once a week, we swap leads. There’s a presenter every week that presents and educates us on a facet of their business and it gives you an opportunity to speak publicly. After 7 years of this I’ve had probably 30 friends there now and they are very much my sort of personal ambassadors. They will get me into meetings I would never be able to get into without that. So I would highly recommend that if you’re interested in sharpening your saw, get into a group like that. One caveat: make sure there’s more business owners that sales reps because I found that a lot of people are just there for the leads as opposed to the personal growth. Fred Diamond: Good. What’s a major initiative you’re working on today to ensure your continued success? Ben Knowlton: My next big initiative here at Metropolitan Shuttle is rolling out the four disciplines of execution. Our listeners can google it. We’re a good company and we’re a good team but to take it to the next level we really need to be able to execute on our important goals despite whatever the whirlwind throws at us. It will help the company to focus on what’s important, not just what’s urgent. Fred Diamond: You’ve had some sales calls that didn’t necessarily go the way you expected. People don’t return your calls or your emails. Why have you continued? What is it about sales as a career that keeps you going? Ben Knowlton: It’s the thrill, the hunt to get started especially as a front line sales person, that closing high is amazing, but helping my team also close deals has been extremely rewarding. It was actually a concern I had of switching from a front line sales person to being on management but now I get to go sales call to sales call with my reps and I get to give out a lot of high fives, it’s even better. Fred Diamond: What’s one final thought you can share to inspire our listeners today? Ben Knowlton: Hone your craft, put in the work and build relationships, the rest will follow.